Fractures, lessions, and joint space abnormal ties are demonstrated. Place lead shield over gonadal area. This position may be taken as a horizontal beam lateral or in the lateral recumbent position. This projection is ideal for the patient who is unable to flex the knee because of pain or trauma. Use a horizontal beam with IR placed beside knee. Place support under knee to avoid cutting off posterior soft tissue structure. This position is designed for patient who are able to flex the knee 20 to 30 degree. Take radiograph with patient in lateral recumbent position, affected side down; give pillow for head; provide support for knee of opposite limb placed behind knee being examined to prevent overrotation. Adjust rotation of body and leg until knee is in a true lateral position (femoral epicondyles directly superimposed and plane of patella perpendicular to plane of IR). Flex knee 20 to 30 degree for lateral recumbent projection (see note 1). Align and center leg and knee to CR and to midline of table or IR. Direct CR to a point 1 inch (2.5 cm) distal to medial epicondyle. Collimate on both sides to skin margins, with full collimation at ends to IR borders to include maximum femur tibia and fibula. Note 1: Additional flexion will tighten muscles and tendons that may obscure important diagnostic information in the joint space. The patella will be drawn into the intercondylar sulcus, also obscuring soft tissue detail from effusion and/or fat pad displacement. Additional flexion may result in fragment separation of patellar fractures, if present. Note 2: Angle CR 7 to 10 degree on short patient with wide pelvis and only about 5 degree on tall, male patient with narrow pelvis for lateral recumbent projection. The distal femur, proximal tibia and fibula, and patella are shown in lateral profile. Femoropatellar and knee joints should be open. A true lateral position of the knee without rotation will demonstrate the posterior borders of the femoral condyles directly superimposed. The patella should be seen in profile with the femoropatellar joint space open. The 5 to 10 degree cephalad angle of CR should result in direct superimposition of the distal borders of the condyles. 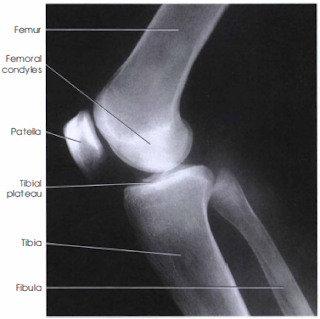 The knee joint is in the center of the collimated field. The top and buttom are collimated minimally. All surrounding soft tissue structures should be included. Optimal exposure with no motion will visualize important soft tissue detail, including fat pads anterior to knee joint and sharp trabecular markings.